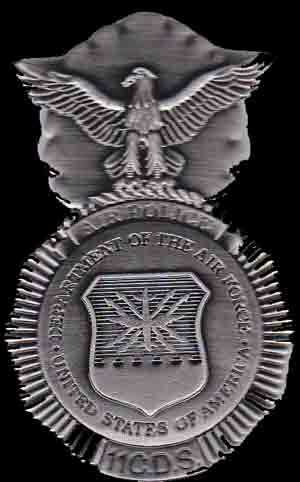 Prior to graduating from high school I enlisted (deferred) in the Air Force. After graduating I slept to noon for six months then reported to my recruiter in January 1963. Sent to Lackland AFB for my basic, Air Police (similar to the Army’s MP) and Sentry Dog Training. About midway through the Air Police school I interviewed to become a Sentry Dog Handler, which was a two-step interview process. Prior to being accepted into the Sentry Dog program I received orders for Wake Island. Yup, Wake Island. I remembered WWII movies about Wake Island but that was it. Off to the library and did a little research which told me that Wake Island was small and I wondered why the heck did the Air Force wanted me to go there. Fortunately, being accepted into K-9 training cancelled my Wake Island orders. Whew!! My first dog’s name was Casey, pictured on the bottom of this page. He was a green dog and not previously trained. We were paired up and I learned how to train a Sentry Dog. Many of the new handlers were assigned a previously trained military working dogs (MWD). In a sense, the trained MWD’s trained their green handlers. At first I was envious of those handlers assigned a trained dog, but it wasn't long before I realized that I was learning how to train Casey and I actually had the advantage. Upon graduation from Sentry Dog School I was assigned to Altus AFB, Altus Oklahoma which was a Strategic Air Command Base, Headquarters 11th Strategic Aerospace Wing, 11th Combat Support Group. B-52 aircraft, Atlas ICBM missiles and a nuclear weapons storage areas. The pale yellow buildings, above right, were our kennels at DaNang Vietnam. I'm on the left. 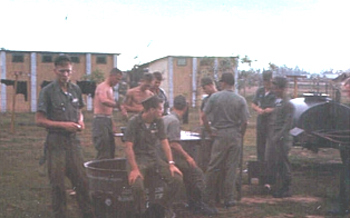 The guys without shirts are some Marines who frequently came to the kennels to "borrow" water from our water buffalo. They were bivouacked next to our kennel area. Needless to say, our kennels were very secure. Left is Dutch in his kennel. Notice how the door was secured. In 1965 we didn't have good facilities for our dogs and for that matter for us either. We bunked out in tents. That's just the way it was then. Later they built some first class facilities for the dogs and the handlers after I rotated back to the States. 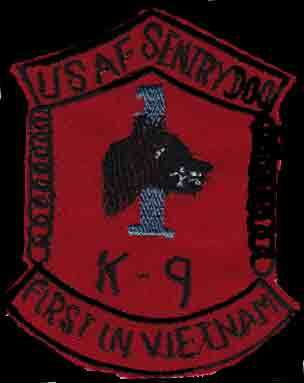 The K-9 teams at Altus AFB were charged with security of those critical areas from dusk to dawn. We had the coolest hats, black leather baseball caps with K-9 in white on both sides. In 1964 our K-9 Section was rated the best of all SAC bases in the US. We did strut with a little swagger, for sure. 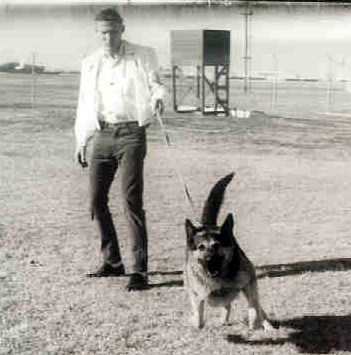 Visiting dignitaries frequently were brought to the kennels for a K-9 demonstration. We even put on a demo for a USO group and some German officers. In May for June 1965, I forget which month, the AF asked for volunteers to go to Vietnam as dog handlers. Didn’t have a clue what Vietnam was or where. My best buddy Mike and I decided what the heck, so we volunteered. 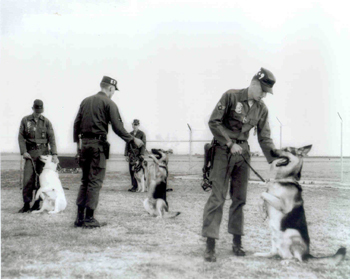 On 6 July 1965, Mike and I and our dogs were sent back to Lackland Sentry Dog School for evaluation. What kind of clued us to what we were getting into is our orders authorized us to hand carry weapons to Vietnam. We then learned that we would be charged with proving that Sentry Dogs could adapt the conditions in Vietnam and secure the perimeter of critical air bases and bomb dumps during the darkness hours. 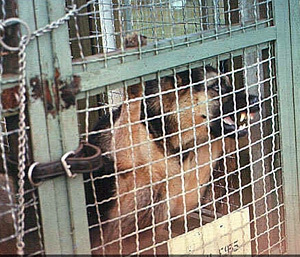 Up to that time dogs were not used by American troops in Vietnam. It was also hinted that the success of the MWD program will fall on our shoulders and the instructors wanted to make sure we had been properly trained and that we matched up with our dogs and were a good team. The operation was called Project Top Dog XLV and I claim it was so name because of my dog Dutch. And in case you haven’t heard, Dutch was the best do to ever set paws in Vietnam. But, each military dog handler will tell you the same thing. In 1965 every attempt to penetrate a perimeter secured by a Sentry Dog team in Vietnam, was repelled. Our success expanded the program to restart the Scout Dog program which had been disbanded after the Korean war, and the beginning of a new discipline called Combat Tracker's. Our Chapter has two Sentry Dog handlers, myself and Dave Hizer. Dave was an Army handler who was at DaNang later in the war. Dave’s dog’s name was Major. 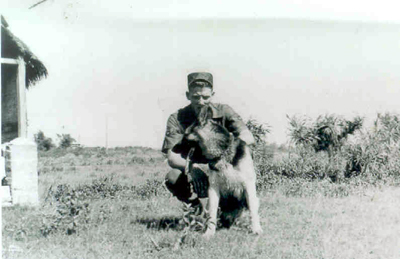 Past Chapter VP Bob Konarske was an Army Combat Tracker dog handler. Bob handled a Black Lab by the name of Opal. There is a link to the Combat Tracker's website on our Links page. Visit their site take a look. The Trackers were in the thick of things! 1963 - Casey and I are in the middle with my back to the camera.